Like many we’ve reviewed, DotVPN is a browser add-on as opposed to a downloadable piece of software. DotVPN claims to be releasing their desktop app in “mid-2017” and given that it’s now late 2018 (and still no desktop app), make of that what you will. 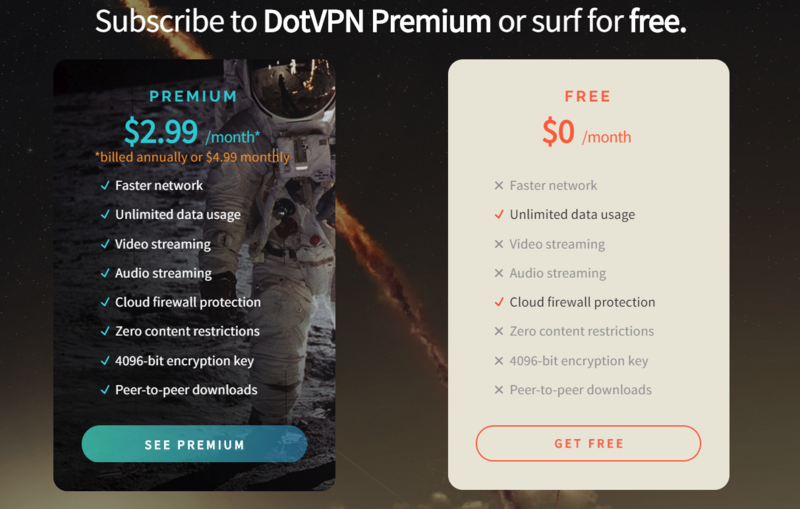 “The better way to VPN” sounds a little odd – the question we have to ask ourselves is whether DotVPN is as good as it claims it is, or if it’s going to join the ranks of those that promise lots and deliver little. Note: Well…this is awkward. Our two Pros on DotVPN center around pricing and signing up. Everything else is average at best. Strap yourself in for a rough review, because it gets messy quickly as you scroll down. Don’t say we didn’t warn you. 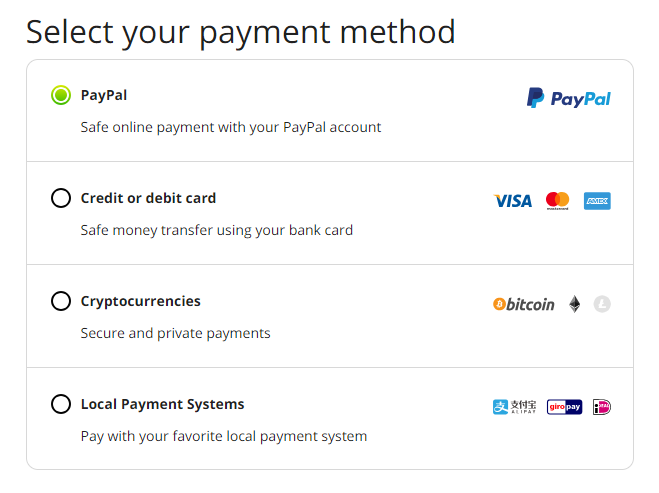 DotVPN offers a solid choice of payment methods, including cryptocurrency and lesser-used methods such as Alipay. While cryptocurrencies offer some level of anonymity, it would still be nice to see this area expand – by offering cash or gift card payments. It’s very easy to install and begin using. 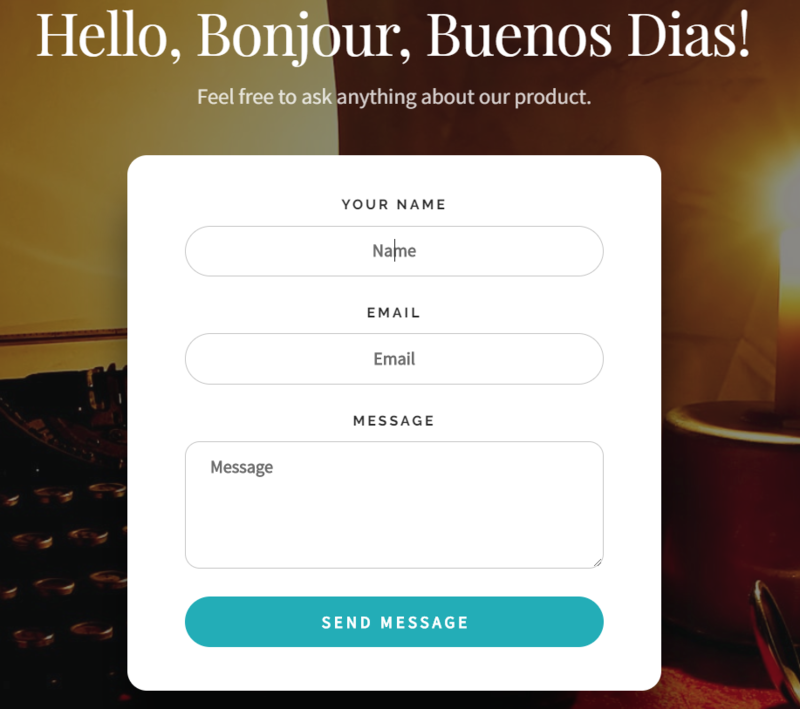 It took all of ten seconds for us to add it to Google Chrome, input an email address and connect to a server. Switching between servers when installed is done through a simple interface that works in seconds. If you are looking for a very simple VPN then DotVPN is plenty suitable. When you combine the number of servers with the fact that you can seamlessly switch between them and use DotVPN on up to five devices, this is solid offering—there’s a lot of choices available. On both their free and premium plans, you can use unlimited bandwidth, however, the free plan’s speeds are throttled. Whilst there are a lot of servers, 12 countries are nothing amazing and it would be nice to see more. DotVPN have two plans: free, and premium. As you can see, their free plan is very restricted. The free plan is slow, can’t be used for streaming video or audio, has restricted content and no encryption. While the premium plan says it offers peer-to-peer downloads, this is not true. The pricing isn’t bad though at $4.99 per month, or $2.99 per month when billed annually, but for that price, you can get so much more for your money from other providers. This is why shoppers shouldn’t look at the price alone. It’s the value that matters. 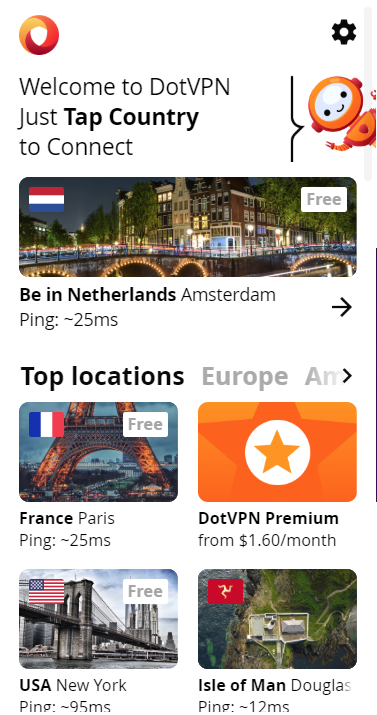 It’s important to remember that DotVPN is two different products: their extension for browsers such as Chrome and their app for iOS and Android devices. The browser add-on, like Hola VPN, is not a true VPN—it is a proxy that protects your browser only. In contrast, a VPN will protect your entire internet usage both within and outside your browser. The only difference between DotVPN and Hola VPN in this regard is that DotVPN doesn’t route traffic through its non-paying users. On the other hand, the DotVPN iOS and Android applications are true VPNs that offer complete protection of all your activity. On iOS they use IPSec and on Android they use OpenVPN. OpenVPN is popularized as the most secure VPN protocol that currently exists—it is an open-source tunneling protocol maintained by the security community. OpenVPN tends to be slow on iOS and so they are using IPsec instead. Still, it is just as secure. In terms of encryption, DotVPN uses AES-128 encryption for their iOS and Android apps. AES-128 is secure, however, it is not as strong as AES-256. Still, AES-128 is considered “safe” by numerous cybersecurity experts and it will certainly benefit your speeds. Remember we just mentioned that AES-128 is faster than AES-256? Well, this little fact doesn’t matter for DotVPN since it’s uber slow. There’s no VPN available that won’t slow your internet speeds to some extent, that is impossible; the cost of being secure on the internet is slightly slower speeds when connected to a VPN. After all, your traffic is being routed through multiple places. When we tested DotVPN’s speeds, however, we were met with nothing but disappointment. The speeds were atrocious, and we don’t use that term lightly. 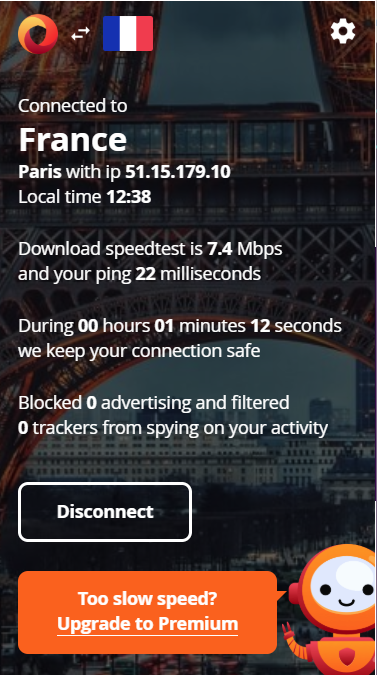 As usual, we tested this VPN with our 100Mbps internet connection that averages at around 97Mbps. Once upon a time, it was easy to get around Netflix’s geo-blocked content restrictions. 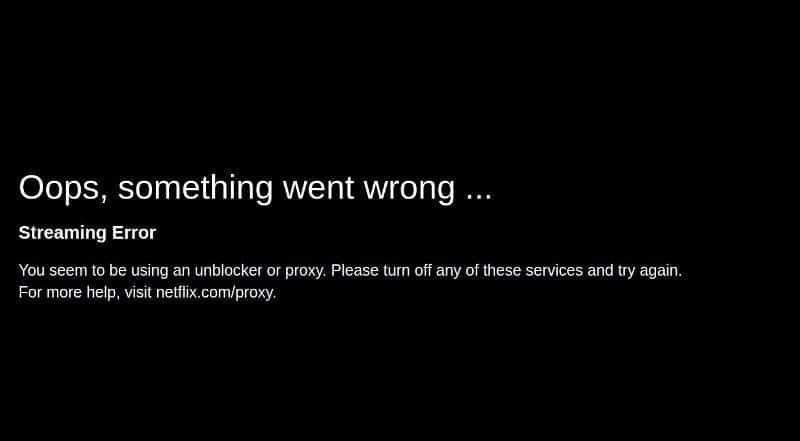 If you wanted to watch a US TV show on Netflix but you were based in the UK, you simply had to connect to a VPN and off you go. DotVPN isn’t one of them. None of their servers work to get around Netflix’s restrictions. But with download speeds like that, why even bother? Aside from Netflix, people use VPNs for peer-to-peer torrenting, however, DotVPN doesn’t allow it. Having a VPN to shield your personal information whilst peer-to-peer torrenting keeps you safe and prevents you from falling victim to threats. Still, very disappointing to see it not supported. Device Compatibility: No desktop support? This is a joke, right? When it comes to devices, DotVPN falls far below the mark. As an add-on primarily, DotVPN supports the likes of Chrome, Firefox and Opera browsers in addition to Android and iOS devices. As we mentioned earlier, they promised a desktop app by late 2017 and this was never delivered. The website mentions this launch date but it’s already late 2018! DotVPN also does not support routers so you can’t use it with consoles and other smart devices such as TVs. Customer Support: Where is it? The only sort of customer support offered is through their “Contact Us” form on their website, that’s it. No social media support. No live chat. No expansive knowledgebase or forum. This is far from ideal. Unfortunately, we never received a response, and it’s been almost one week since sending our initial email. Although DotVPN is easy to use, not everyone will understand how, especially newbies, and the lack of customer support is inexcusable. There is a very basic repository of questions available here. These articles go over the most frequently asked questions and basic setup guides. To be honest, the contents are a bit thin as well. There’s nothing in-depth about these articles. If a VPN logs your information then its security is called into question and even though many VPNs claim not to do this, they aren’t always telling the whole truth. So, what about DotVPN? As you can see, they store a handful of your information. None of it seems to pertain to what you’re accessing or downloading, but it’s down to you to determine how much information is too much. Frankly, seeing your IP logged is enough for us to throw this in the Cons pile. IP and DNS Leak Test: Sir! We have bogies, incoming! Even for the best VPN, a leak can be fatal. Whether it’s a DNS leak or WebRTC leak, the end result is the same—your privacy and anonymity are put at great risk and this is something that should be a deal breaker if you are looking for complete privacy. An IP and DNS leak puts your personal information at risk from people who are watching, be that ISPs, the government, or hackers. This is especially bad if are politically involved or are doing something illegal. We run tests on every VPN we review to uncover leaks. DotVPN failed quite hard. It failed the tests on two of the most popular test sites. This isn’t good. A kill switch is something that you should always check for when looking for a new VPN service. To put it simply, a kill switch will protect you if your connection to a VPN drops. When this happens and there is no kill switch in a VPN, your IP is at risk of being exposed to your ISP or whoever else is watching. However, a kill switch completely kills your connection to a site and stops anything from leaking. Unfortunately, DotVPN does not have a kill switch. There’s not much information about DotVPN other than its address registered in Hong Kong. The Chrome extension has about 950,000+ downloads and there are 3,300+ reviews in the Google Play Store. So it looks like it serves a decent amount of users. DotVPN is owned by Smart Security Limited, a company that operates out of Hong Kong. This means they are officially outside of any Five, Nine and Fourteen Eyes jurisdiction. We’ve seen this kind of freemium model before, and DotVPN is nothing special. In fact, it falls behind in actually implementing the features that they promise on their website. 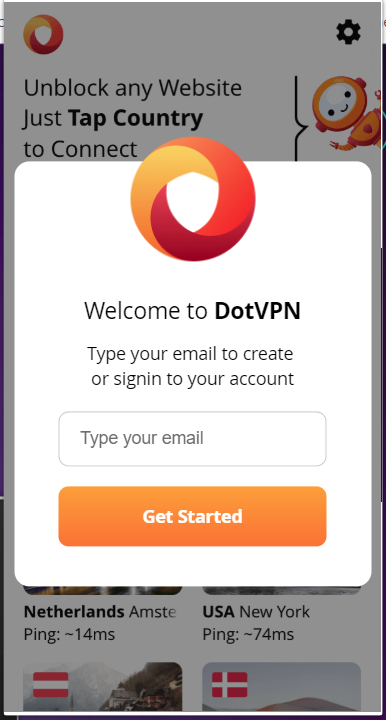 So, do we recommend using DotVPN? Not really is the short answer. DotVPN completely failed in our internet speed tests, has a lack of security (through the browser, at least), no customer support and no kill switch among other problems. And the number of leaks is simply terrible. These leaks in addition to the lack of kill switch lead us to believe that DotVPN will completely fail to protect you. They also log your IP. What a bummer! But we won’t leave you out here to dry. We highly recommend these top 10 picks instead.